Gigi Hadid declared her love for Zayn Malik with this t-shirt | HELLO! May 16, 2016 - 14:44 BST hellomagazine.com Cute! Stepping out in New York on Saturday, the supermodel sported a white t-shirt emblazoned with the caption: "lol ur not zayn malik". Gigi was attending Drake's Saturday Night Live afterparty while Zayn was in Los Angeles. Clearly appreciative of the gesture, Zayn tweeted a photo of his girlfriend's look. 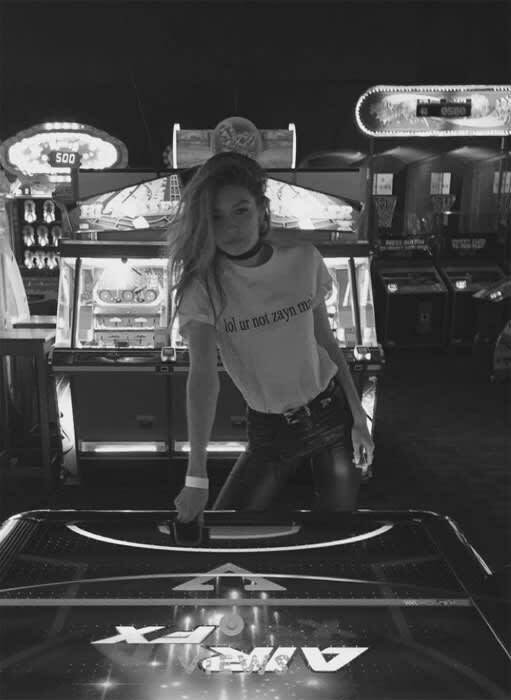 "Thas ma girl," he captioned the shot of Gigi in an arcade, poised to play air hockey. "G.I," read her top, a reference to the nickname best friend Cara Delevingne gave her and Joe, 'G.I. Joe'. Cara had coined the nickname when she posted a snap of the couple on Instagram. Gigi and former One Direction star Zayn made their red carpet debut earlier this month when they attended the Met Gala in New York together. They made for quite the handsome couple as they stepped out at the fashion bash, each putting their own fun spin on the theme.